Justice Paul McDermott said: “In this case, there are disturbing elements in relation to the disposal of the body,” as he began his charge. Justice Paul McDermott began charging the jury today. A MURDER TRIAL judge has noted the ‘disturbing elements’ relating to the disposal of the body in a case where the accused said he ‘chopped’ his friend up with a chainsaw after shooting him dead in self-defence. However, he told the jury that the ‘horror’ shouldn’t determine its verdict, with the main issue to decide being how his death was brought about. 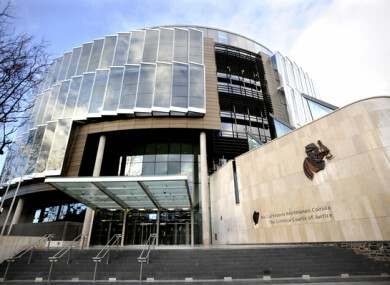 Justice Paul McDermott began charging the jury today following a trial at the Central Criminal Court. Paul Wells Snr (50) of Barnamore Park, Finglas has admitted shooting dead fellow Dubliner Kenneth O’Brien and dismembering his body. However, the father-of-five has pleaded not guilty to murdering the 33-year-old at his home in Barnamore Park on 15th or 16th January, 2016. He claims that the deceased had wanted him to murder O’Brien’s partner, so that he could take their child back to Australia, where he had previously lived. He told Gardaí that O’Brien had brought a gun to his house for this purpose on the evening of the 15th but that he didn’t want to do it. He said this resulted in a scuffle between them, that the gun fell, they both tried to get it, but that he got to it first and shot his friend in the back of the head. He said that he then panicked, ‘chopped him into pieces’ with a chainsaw O’Brien had lent him, put his torso into O’Brien’s suitcase and dumped it in the Grand Canal. “In this case, there are disturbing elements in relation to the disposal of the body,” said Justice McDermott, as he began his charge. “The main issue in this case is how the deceased died, how was his death brought about, what were the circumstances of his death,” he explained. He told the jury to consider the state of mind in which the killing was done, whether it was intended or not, or was self-defence or not. However, he told the jury that it could consider something done afterwards to cover his tracks ‘if it’s suggested that it indicates state of mind on the part of the perpetrator’. He said that it was for the jury to decide if Wells had intended to cause death or serious injury when discharging the firearm into the back of Mr O’Brien’s head. He said that if the jury was satisfied beyond reasonable doubt that Wells was the aggressor and that this was a planned assassination, that would be murder. He explained that a homicide was not murder if committed in reasonable self-defence. He told the jurors that they had to consider all the evidence in the case, how O’Brien came to be at Wells’ house, why he was there, what happened, what ensued after he arrived, the nature of the row or fight that Wells described, his description of the gun falling to the ground, the struggle to get that gun and the accused man’s ‘state of mind when he got that gun’. He said that if they reached a view that Mr Wells was in a situation that justified the use of some force, but he used more force than he knew to be reasonably necessary, the appropriate verdict would be guilty of murder. He said the jury was also entitled to conclude that he did not believe any force was necessary. “If Wells killed O’Brien because he honestly believed that the level of force that he used in discharging the gun into the back of his head was, in that time and place, necessary to defend himself, but in doing so used a greater degree of force than a reasonable man would have considered necessary, the appropriate verdict in that situation would be not guilty of murder but guilty of manslaughter,” he explained. He said that a full defence to murder was open if he killed O’Brien using such force as was, in the circumstances, reasonably necessary. “If there’s a reasonable possibility that hasn’t been excluded by the prosecution, you simply acquit him,” he said. He explained that if one man attacked the other, the other man had the right to strike a blow in his own defence without waiting to be struck. The jury had earlier heard the conclusion of the defence’s closing speech. Michael O’Higgins Senior Counsel told the jurors that one of the things they’d do when deliberating would be to use their common sense. He asked them to keep that to the fore and not rush to any conclusions. He asked where the evidence was to disprove his client’s account of landing behind the deceased in a ‘row-your-boat’ position during the scuffle and immediately before the shooting. He asked where a ballistics expert was to give an indication of the possible explanations for the slightly downward trajectory of the bullet. He noted the pathology evidence that the weapon had been pressed against the back of the head at the time of the shooting. “If people are struggling on the ground and there’s a battle for the gun and people are moving, I suggest it’s … possible the head and gun could come in contact,” he said. He suggested that it was equally possible that, in the heat of that tussle, a gun could be applied to the head and discharged. He said that the real question was whether it was reasonably possible that ‘if it wasn’t going to be O’Brien, it was going to be Mr Wells’. If the answer was yes, there should be an acquittal, he explained. However, if they found that Wells had over-reacted, then the verdict should be manslaughter, he concluded. Justice McDermott will continue his charge on Monday before sending the jury out to consider its verdict. Comments are closed for legal reasons as the trial is ongoing. Email “Judge highlights 'disturbing disposal of body' in Kenneth O’Brien murder trial”. Feedback on “Judge highlights 'disturbing disposal of body' in Kenneth O’Brien murder trial”.